Following a dismal season, Tim Tebow was given the boot by the NY Jets and replaced by quarterback Gino Smith. Hopefully this will finally prove to NFL fans that praying doesn’t actually work, so quit asking for the Cleveland Browns to beat the 13 point spread so you can win $40 in the office pool, selfish prick. 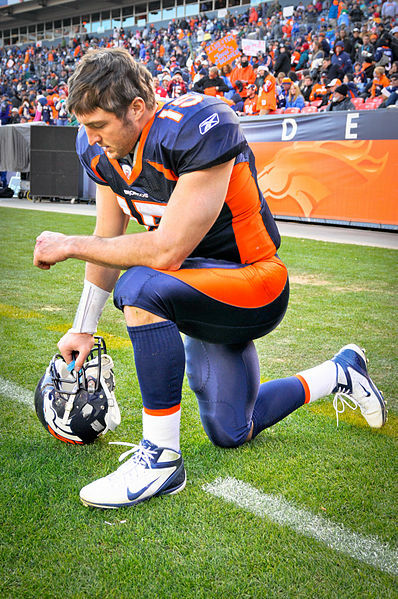 Tebow captured the nation’s attention and hearts with his wholesome image, admitting that he was a virgin and often dropping to his knees on the field to give thanks. It seems like the Jets got caught up in the teen-girl fanaticism surrounding Tebow and failed to consider more important things like, oh I dunno, can he throw a ball? The move reportedly cost the Jets $4 million, but will be made up for in team morale now that they don’t have Tebow proselytizing in the locker room while staring at everyone’s junk. This entry was posted in The Box and tagged tim tebbow cut, tim tebow, tim tebow cut from jets, tim tebow fired, tim tebow fired from jets, tim tebow free agent, tim tebow released, tim tebow released from jets, tim tebow vadge by thevadge. Bookmark the permalink.